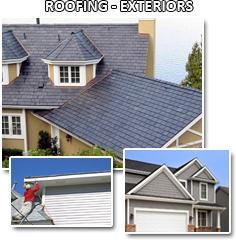 All American Roofing and Siding is dedicated to providing high quality roofing and exterior services. Servicing the entire Irving and Dallas / Fort Worth area. A roof is considered to be the covering of any type of structure, be it a residential or a commercial space, and is therefore important in keeping the entire building, especially its interior part, to be in good shape. It serves as a protection from the various effects of weather such as rains, snow, and other such natural circumstances, as well as from the invasion of animals. All American Roofing and Siding recognizes this importance, and we therefore dedicate all our resources to keeping anyones roof in good and perfect shape. Maintaining the roofing or exterior structure is no easy job. But with All American Roofing and Siding, you can be assured that any problems will be fixed with the best attention to detail, and that this can be promptly resolved to keep the residents and occupants of the building worry-free. If you are in need of a general contractor, our company would definitely be the perfect choice. Equipped with a proven track record, excellent reviews, and reliable workmanship, our company can guarantee you of a professional and efficient service that would be difficult to find elsewhere. All American Roofing and Siding offers you both roofing services and exterior services, which is another proof of our all around professionalism. We have a wide range or services which include free evaluations and emergency roof repairs; exterior services which include work concerning siding & Soffit & Fascia. Services such as installations and replacements are our specialty. By trusting a reliable company such as ours, your structure, be it a residential or commercial one, will be provided with excellent roofing and exterior care to guarantee a secure place for everyone. By depending on an excellent general contractor for your roofing needs, you can be certain of a secure place not only for yourself, but also for the people with and around you. You do not have to wait for the time that your roof is already dying of age or other unforeseen circumstances, and be part of our long list of happy and satisfied customers who is in no doubt secure of their buildings. Trust only in a good roofing company; trust All American Roofing and Siding.